Most people spend the day after Christmas with their families. But a man started a journey across the Atlantic in a barrel. The navigator Jean-Jacques Savin from France is currently floating in a bright orange barrel somewhere in the Atlantic. He hopes to reach the Caribbean in three months to the end of March, driven only by ocean currents. "The goal? Maybe to prove that I still have it." Savin told the news agency AFP . 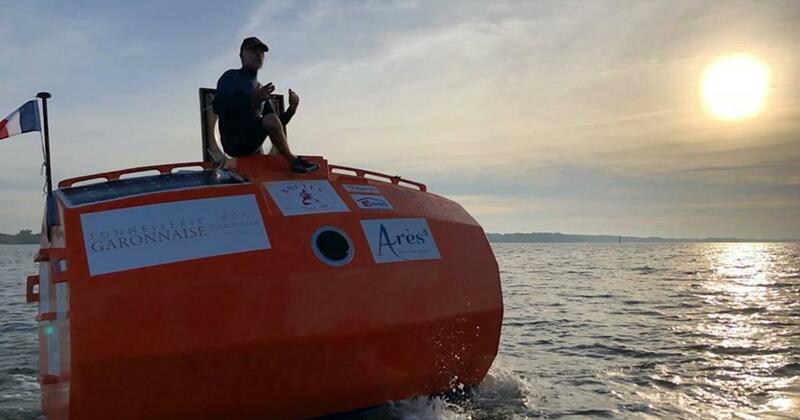 He hopes that the currents will transport the barrel from its starting point to the Canary Islands off the West African coast somewhere in the Caribbean. He does not know exactly where he will end, but he hopes for a French island like Martinique or Guadalupe. "It would be easier for the paperwork and for the recovery of the barrel," he said. Savin is no stranger to adventure. He is a former military parachutist who also worked as a park attendant and pilot. According to his website, he has already crossed the Atlantic four times with a sailboat. This time, he envisioned a crossroads where the man would not be the captain of his boat but the ocean passenger. Before starting his trek, he worked on the ship for several months. Inside there are six square meters of living space. The barrel weighs 990 pounds when it is empty and has a bunk, a kitchen and a storage area. Each side has a porthole, including one on the bottom, so Savin can look at passing fish. However, he has not completely given up on luxury. Stashed is a block of foie gras and a bottle of Sauternes white wine for New Year's Eve and a bottle of red Saint-Emilion for his 72nd birthday in January. During the voyage Savin Marker will drop for the international ocean observatory JCOMMOPS to help her oceanographers study the currents. Scientists will also explore how loneliness and close captivity affect him. Even his wine is being watched. A Bordeaux aboard is compared to one that is kept ashore after the trip is over. Although Savin is traveling alone, the whole world can follow the journey. He tracks his progress online and posts daily updates and GPS coordinates on his Facebook page.